The NHL Trade Deadline is just around the corner, and on Feb. 25, teams won’t be able to make trades until after the season is over. Perhaps not until after a victory parade in June. However, are the Bruins close enough to have a shot at that victory parade that has taken place in Boston twice in the past four months? It sure seems like the Boston Bruins are in need of a piece or two in order to become a legitimate Stanley Cup contender. They appear to be in the playoff mix, despite a lack in their offensive depth. The production and depth outside of the top line are simply not good enough for a long playoff run. Many players have been rumored to Boston over the past couple of months. Whether it was Artemi Panarin, Wayne Simmonds, Micheal Ferland or Charlie Coyle, the new names always come out. One name that hasn’t been strongly linked with the Bruins, but they are definitely targeting him, is Jakob Silfverberg. Per The Athletic, Jakob Silfverberg is indeed on the Bruins radar. 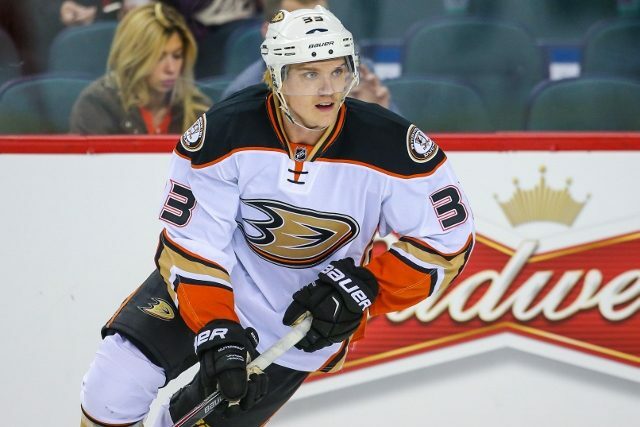 Silfverberg is a 28-years-old right-winger from Sweden and has played in 466 games in the NHL with the Ducks and Senators. Silfverberg has collected 105 goals and 124 assists for 229 points so far in his career, adding another 45 points in 69 playoff games. Now let’s look at Silfverberg in the present season. Over 47 games played with the Anaheim Ducks, the Swede has recorded 12 goals and eight assists. His even-strength +/- is listed with -11. While not ideal, if you look at the Anaheim Ducks and their current season, they aren’t exactly having an ideal season. Silfverberg had 40 points in 77 games last season and was +8 in even-strength –– and Anaheim was a playoff team last year. Silfverberg is a 28-years-old rental with the salary cap hit of $3,750,000. Notwithstanding, the Swedish forward is a solid 200-foot player, a versatile skater and can play in all situations. What’s the most important thing for the Bruins? The fact the asking price for him won’t be sky-high, he would definitely be a low-cost solid addition. The second most important thing is that he is a natural right-winger just as David Krejci needs on his line. Or even maybe the top Bruins line with Brad Marchand and Patrice Bergeron if Head Coach Bruce Cassidy continues to use David Pastrnak on the right wing of the second line. Despite mentioning it already once in this article, it´s worth repeating. Silfverberg has 45 points in 69 playoff games. The Bruins should be already well aware of any Ducks player, who had great playoff stats. But hey, nobody said the Bruins are going to re-sign him for five years in the summer. Silfverberg is a two-way player with great hockey IQ and might become clutch in the playoffs. If the Ducks doesn’t ask a crazily high price for him, which shouldn’t be the case, the Bruins will undoubtedly consider acquiring Silfverberg.